The Sunday Salon: July Books Recap [8.7.11] – my books. my life. I didn’t post my monthly update last Sunday because I thought, “Hey, it’s only July 31, I could still finish another book today.” Then on Monday, when I very predictably had not finished another book, I remembered that I don’t really read much these days and that was very silly logic on my part. So what did I read in July? I finished seven books: 5 print and 2 audio. My favorite book this month was Feed. 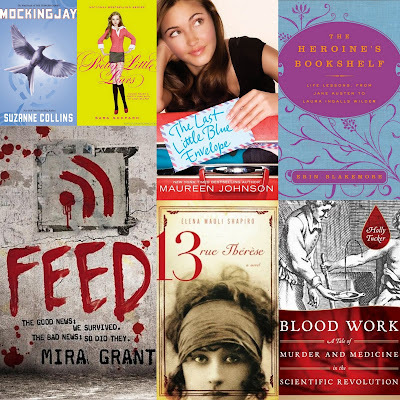 My least favorite was probably my Mockingjay reread. Previous Article Audiobook listeners: Do you take breaks? I also did not like Mockingjay. I am glad that your husband is coming home, and I can imagine that you are pretty darn excited about that! I have never lived apart from my husband, but I can imagine that it would be stressful and hard for me. Five days is going to go by so fast, and then you will have him there with you again. Very excited for you! I KNEW I should have bought Feed when I was at Borders this week, but I picked something else instead. Tsk tsk. I tried to read 13 rue Therese way back but had to give up, don’t know why, couldn’t get into it. Yay for your husband coming home soon! It would be tough to be apart for so long – I can’t imagine living apart for an entire year! I keep hearing great things about Feed – I may have to check it out at some point. Yay for getting you husband back! 🙂 Also, I love the look of Blood Work, it’s going on my tbr.